It all started with friendship but it became more than that… Five good friends - Horng Qing, Kun Quan, Eugene, Nicholas and Natasha decided to pursue a dream of owning a café together and that was how Two Scones One Cup was born. 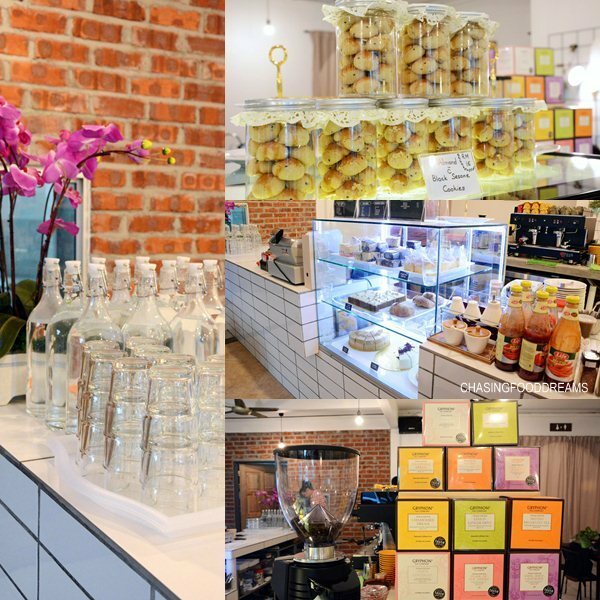 Armed with one of their mother’s recipes for classic baked goods, the five set sail on a delicious journey in serving up hearty and comfort food in Two Scones One Cup, located in a housing neighborhood in Section 17, PJ. 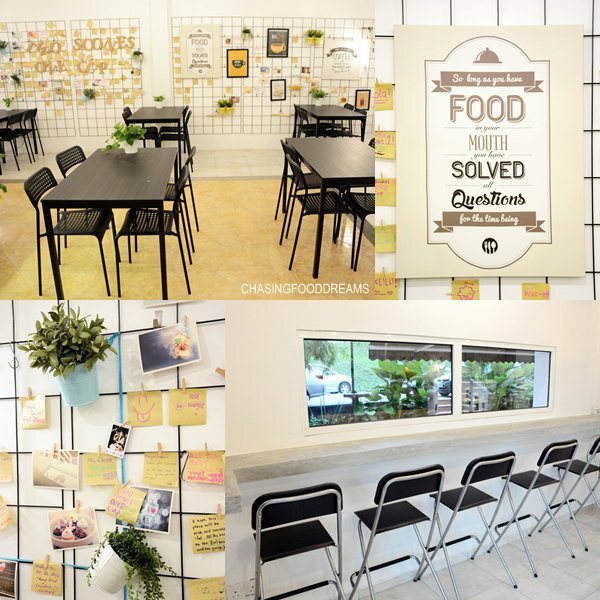 While many opted to go with the latest and creative dishes of fusion that is served in many cafes, Two Scones One Cup takes on the pure old school and childhood treats as part of their concept. The menu is filled with a good selections of light meals and main courses as well as homemade scones and cakes. Besides the food, the ambience is pleasant and cozy. The café is fairly spacious, filled with lots of white and has a wall of creative musings from everyone. The café is designed well to show off a lovely counter for baked goods and has all the seating surrounding the bar. The interior is modern and simple. One can choose to dine in the cool café or alfresco at the patio nicely filled with walls of green shrub for privacy. The patio area is also perfect for garden parties or private parties. There’s plenty of drinks to quench your thirst. I had a refreshing Cucumber Lime (RM10) and was pretty happy with it. There’s coffee, tea, soda, juices and coolers as well. It is indeed pretty difficult to find good scones. Scones should be crumbly in texture but not too dry. They usually have a buttery note too. When I saw the heaps of golden baked scones at the counter, I was pretty sure that I am in for a treat of scones. There are always several varieties of scones available daily. When I was there that evening, there was Original, Raisins, Cranberry and Matcha. The scones look utterly delectable. I couldn’t wait to sink my teeth into these golden beauties served with their own homemade spreads. An order of 2 Scones (RM9) comes with your choice of clotted cream, butter, jam or kaya. 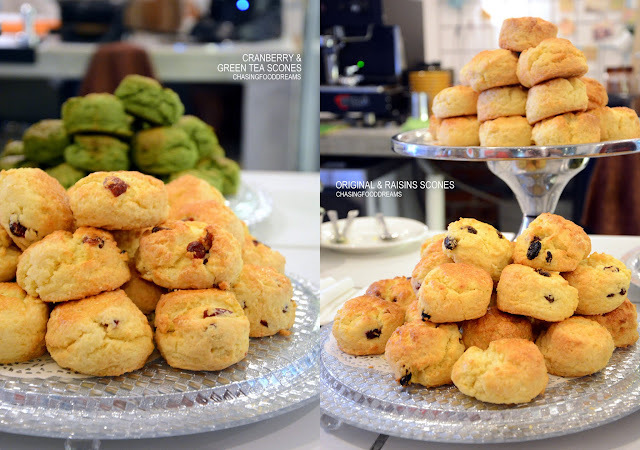 Two Scones One Cup also has a Tea Set (RM49.90 for two person) available. One gets a lovely array of Scones, Orange Cake, Marble Cake, Petit Sandwiches, Carrot Walnut Cake and Macaron served with your choice of tea. The cakes may vary depending on what’s freshly out of the oven that day. Savoring the cakes at Two Scones One Cup brought me back to my childhood days. Cakes were simple but made with quality ingredients. There’s nothing to hide behind a butter cake but good butter and fresh eggs. The cakes here reminded me of how good simple cakes used to be. The Orange and Marble Cake was buttery and has a fine texture. It is cakes that I can savor happily. It’s not too sweet and tasted so rich in flavours. The Carrot Walnut Cake was good too as it is moist and aromatic with cinnamon and other spices. The café even has Victoria Sponge, a British classic of sponge cake sandwich with jam and cream. Other baked goodies include brownies, cheesecake, kaya swissroll, kaya cake, cream puffs and more. Besides their classic baked goods, Two Scones One Cup also has a solid list of local and Western dishes plus sandwiches and light snacks. Tuna Croissant (RM8.90), simple but made well. Buttery and flaky croissant stuffed with creamy tuna and greens, served with side of fries. It is when you can’t decide which appetizer to order or if you are dining in a group, then Mix Platter (RM17.90) is a decent choice for some bites. Light crispy squid, chicken wings, hotdogs and fries made up for the platter. Spicy Cream with Seafood Spaghetti (RM16.90) came with generous seafood in a rich creamy sauce. This one was a lovely surprise as it had a good kick of heat in the sauce. Spiked with chili padi, the sauce is luscious and scrumptious, making it also easy to enjoy as the heat balanced up the creaminess. Good injection of our local touch in the pasta dish! There are also Western classics like Salmon Steak (RM29.90), Chicken Chop (RM15.90) and Lamb Rack (RM24.90). For salmon, make sure to tell them how you like it prepared else it will be well done for you. Overall, the dishes are well-seasoned and flavourful while the portions are really value-for-money. The proteins are served with mashed potatoes or fries and greens. The café even has an All Day Big Breakfast set priced at only RM12.90. We ended with Chocolate Brownies with Ice Cream (RM8.50). It’s a darn good brownie with a crusty outside and gooey inside served with ice cream. Opens daily from 10.30am – 10.30pm. Oooo...haven't had scones for ages. I'd go for the plain buttery ones with clotted cream & fruit jam. Yummmmm!!!! The fried rice looks great too!